On December 11 I visited Cartagena , and saw the Consejo (Council), the Legislative body in a Municipality in Colombia (each Municipality in the country has one). Outside of their offices I saw a flag which was a rectangular white background with the Colonial Coat of Armsin the middle. The flag has the Coat of Arms on the obverse as well as the reverse. 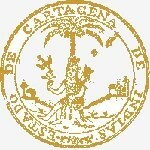 The "Republican" Coat of Arms of Cartagena was originally intended to be used as the Seal for official documents and charge a Postal Tax on all documents sealed with it, a measure adopted in the rest of the newly independent States ( ) as a way for colecting taxes (public income for the State to cover its own expenses). 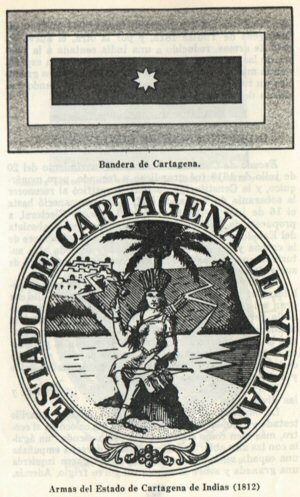 The first mention of this Seal was on , and later this same Seal was replicated onto coins, the latter being mentioned first on the Gazeta 14 (Gazette 14) of July 16, 1812, not having the same detail though, as seen in the following pages of the document. Source: Bulletin No. 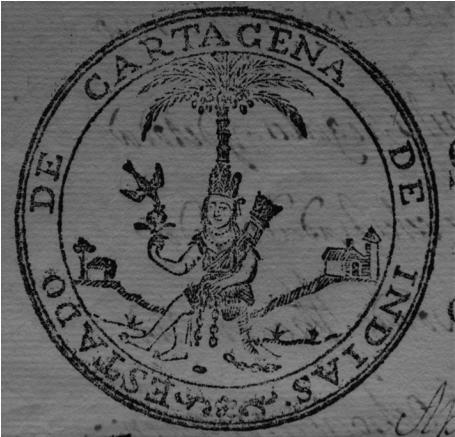 88 of the Fundación Numismáticos de Colombia ISSN-0122-1345, Numismatics of Colombia, firs semester of 2010 Foundation, found here.